For the month of December, the first graders will be going to the YMCA for a half hour tennis class each week. Mrs. Welch's class will go on Monday's from 1:30-2:00, Miss Lincoln's class will go on Tuesday's from 1:30-2:00 and Mrs. Verney's class will go on Wednesday's from 1:30-2:00. Thanks to our GSB community, friends, families and generous donor's across the state and country, first grade had TWO projects fully fund on #GivingTuesday. 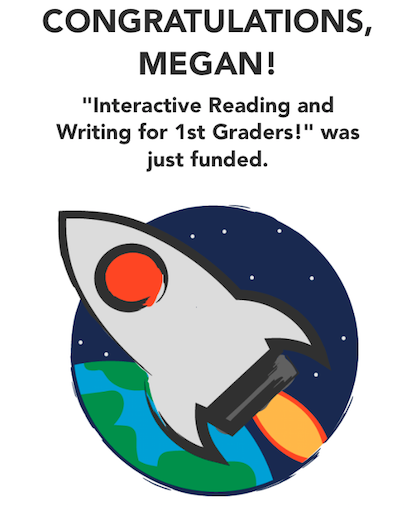 We are so excited and want to thank all of you who shared our projects on social media or made a donation to our classroom. Your continued support is appreciated as we work hard to make sure our students have the tools and materials they need to learn. Mrs. Verney will be receiving a beautiful new easel (pictured below.) 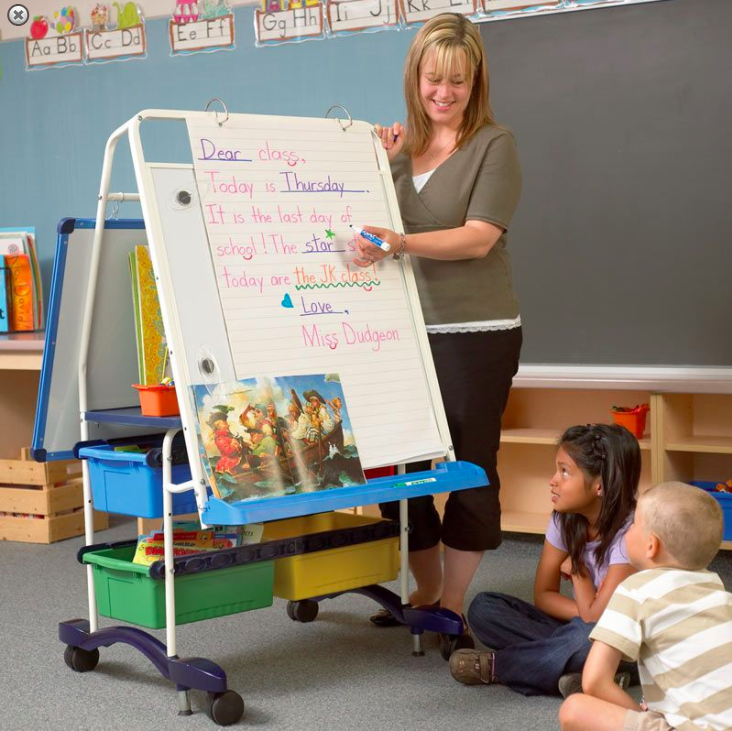 She will use the easel in all subject areas and it will provide another space for students to work during literacy work stations. Miss Lincoln will be adding to our leveled literacy library with sets of guided reading books to help some of our struggling readers. We can't wait to share photographs of our students using these materials after they arrive! First, we would like to thank you for all of your support during the first trimester. It is a big transition from Kindergarten to First Grade and we have to say it has gone pretty well this year. We are enjoying working together as a team to educate our students. Our classes really love coming together as a group to learn, play games and do activities. We appreciate the feedback on homework and our new math program that we received at parent teacher conferences. Please feel free to communicate any questions, concerns or celebrations with your child’s teacher. We are here to listen, help and collaborate with families to make life in First Grade better! At the beginning of the school year we did not request any materials or supplies to be sent from home. 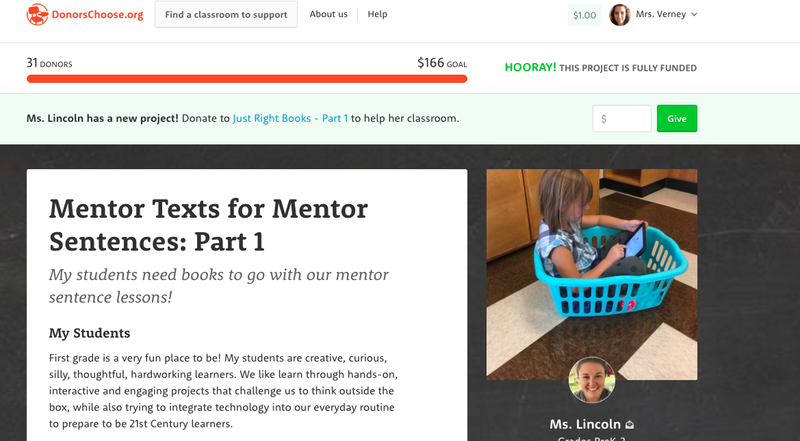 This year, we are using DonorsChoose.org to help acquire some of the bigger items we need in first grade. We have already received a few donations from GSB families. Miss Lincoln and Mrs. Verney have already had projects funded. Miss Lincoln got a class set of bluetooth headphones, a tiggly to use with the iPads and sets of leveled guided reading books. Mrs. Verney received a class set of bluetooth headphones from a project that was funded over the summer and a set of leveled guided reading books! Some of the other materials we need for first grade are a large rug to accommodate all of our classes for group lessons, an easel with whiteboards, storage baskets and hooks for pocket charts, sets of leveled guided reading book and literacy games for workstations. Tuesday, November 28th is “Giving Tuesday.” DonorsChoose.org is generously giving away $5000 gift cards in honor of “Giving Tuesday.” For every donation made, the donor will be entered to win and every donation received, the teacher is entered to win. Currently, first grade has 8 projects that are live on the website. 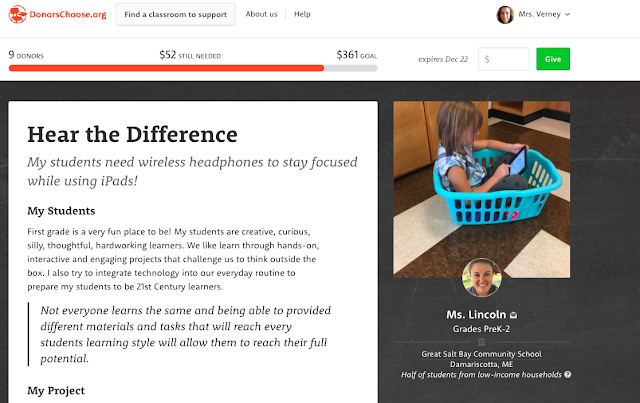 If you donate a dollar to each project, you have 8 chances towards winning the $5000 DonorsChoose.org gift card and the first grade has 8 chances towards winning. Every donation not only helps fund our project but also promotes it. The more “donors’ we have, the more likely we are to be funded by companies or individuals not associated with the school. 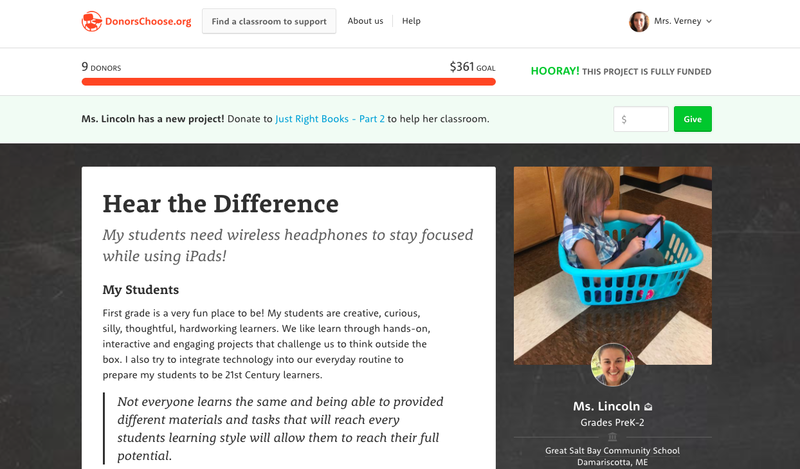 In lieu of holiday gifts we would be so grateful to receive a small donation to one of our DonorsChoose.org projects! First graders helped our Agriculture teacher, Margaret Coleman shell black beans for the "Food Bank Farm." The beans we planted and harvested by other GSB students. The beans will be available at our local food bank for families in need. Holiday book orders were sent home yesterday. They are due back in paper form by November 30th or online December 1st. If you are ordering online for the first time, our classroom code is G3JC4! If you are ordering gifts, please let your child's classroom teacher know and we can hold them for you or send them home in a concealed package. 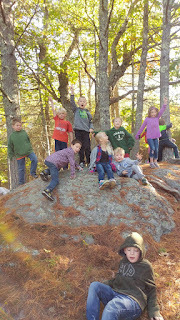 Tuesday, November 7th our first graders went to Hidden Valley Nature Center for Outdoor Classroom with Mrs. Davis, Mrs. Herrick, Mrs. Peaslee and Ms. Schaff. We would like to thank our parent volunteers, Sarah Teele and Sara McKenzie. Here are a few pictures from their trip. Students enjoyed hiking, coloring in nature, playing games, climbing and exploring the bog. In the bog, students discovered carnivorous Pitcher plants. They were excited to find ice inside some of the Pitcher plants! Don't forget to sign up for Parent-Teacher Conferences! Thanks to a few generous, local donors Miss Lincoln's Donor's Choose project was fully funded. Her new headphones arrived today. I have attached pictures of first graders working with their NEW bluetooth headphones! The first grade now owns 31 pairs of bluetooth headphones! The Bill & Melinda Gates Foundation, Jane Oliver-Gravel, Sara Mckenzie, Tashia Maureen, Kassie Lincoln, Mylissa Welch, Christina Purcell, Advancement Courses, and "The Golf Guys!" We had a great trip to Old Fort Western! The weather was beautiful and the kiddos were excited to learn about life long ago! They had the opportunity to learn about textiles. They helped card sheep's wool and watched it be spun into yarn. They learned about looms, how clothes were made and what fibers were used to make fabric. In the kitchen they learned about how they cooked long ago. They made cinnamon, sugar toast. Each child helped grind the cinnamon and sugar and enjoyed eating the special treat they prepared. Outside they helped to split wood for the fire in the kitchen. Our group enjoyed learning about how they made fire and why they needed fire long ago. Our students also enjoyed playing games from long ago. We look forward to continuing our long ago study. A big THANK YOU to Erin Michaud for chaperoning on our trip. Let's help Miss Lincoln with the last $52 of her project. She is working hard to get Bluetooth Headphones for her class! Here is a picture of Mrs. Verney's Class using their headphones from a Donor's Choose project that was flash funded by BJ's Wholesale! Our kiddos had a blast doing the PTO sponsored "Jog-a-Thon!" If you haven't returned your envelope, there is still time! We spent the morning at Hidden Valley Nature Center in Whitefield. If you haven't been and want to spend some time in the woods with your family, this is a great place to do it. We walked in and ate snack at the barn. After we hiked to the yurt and saw the "Hidden Valley" before returning to school. When we returned we read books aloud outside, played a game as a whole group, Mrs. Lincoln's class had the opportunity to press cider and we did some drawing and writing in the Christmas trees. We of course had to end the day with extra recess. We would like to thank Erin Michaud and Carolyn Siegel for joining us on our trip. We always appreciate our classroom chaperones.